When it’s birthday time, nothing can stop us from partying. Not rain, nor wind, nor a hurricane expected to bring both. Friday night found us out in Kenmore, rain/drinking boots on, doing our part to combat Hurricane Early by drinking enough hurricanes to lower him to just a tropical storm. And it worked! Celebratory nachos seemed to be in order, so we took a break from darts and charades at Cornwall’s to try out the ‘chos. 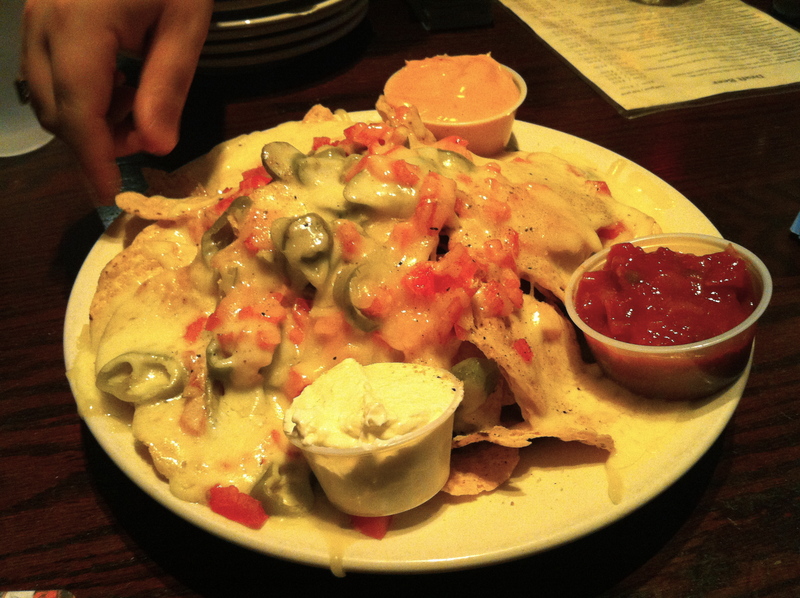 We’ve unofficially reviewed the nachos at Cornwall’s before and found them….less than satisfactory. But if so, then time to put it on the books! Without consulting their menu, we alerted our waitress to our desperate need for the house nachos (they don’t normally come with chili so we went without). Appearance: (6) Certainly cheesy, with oozing white cheddar barely masking some tomatoes and serious jalapenos. On the side in plastic cups, the holy trinity of nacho condiments: salsa, sour cream, and…..queso dip? Huh?? Quality of Ingredients: (5) The melted white cheddar was delicious on top. The salsa and queso….not so much. The cheese sauce was barely even warmed! Had we wanted to pour it over it would have been nothing but a big glob. Salsa was nothing distinctive, chips likewise. The black pepper on top was inspired. So simple, yet so delicious! Distribution of Toppings: (5) There was a ton of cheese on top but nothing on the lower layers. It suddenly becomes clear: the double-cheese is deliberate, knowing that we’ll get bored with the naked chips underneath and need something to dip them in. Why not just skip the queso altogether and just divide the cheese into two layers? Efficiency, people! Price: (4) Since we flagged down a waitress and hollered for nachos rather than seeing the menu first, we knew that a lot would depend on the price. And…$9? Without chili or chicken or anything? Talk about a shock! Overall: 20/40. We always forget that this place has food…and for good reason. A great place to get your drink on but the nachos are a total waste of money.